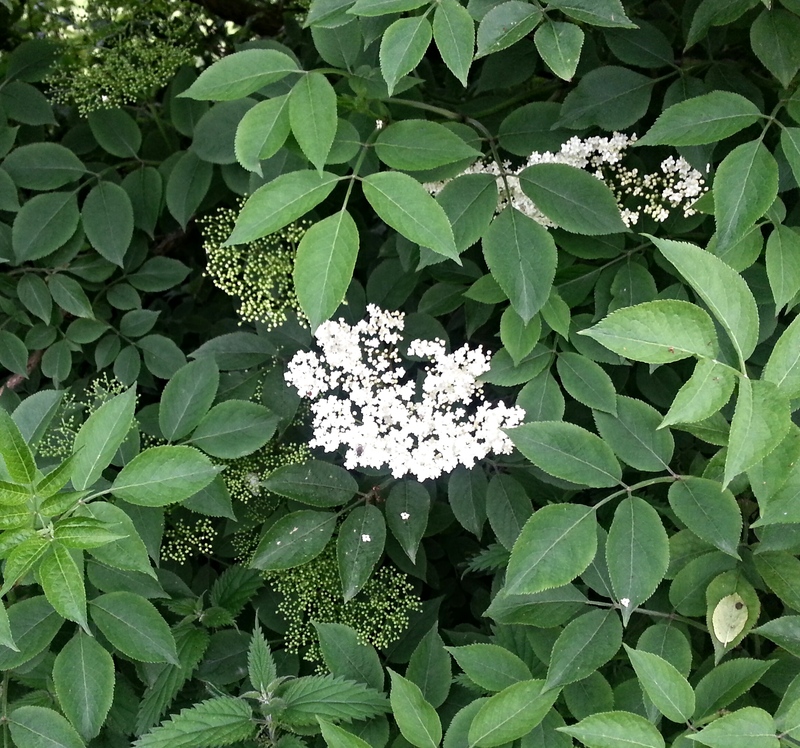 Nothing reminds me more of summer than the heady scent of elderflowers. Elderflowers in our garden have been slow to bloom this year for obvious reasons but they are out in their full glory at the moment. I’ve been preserving that smell in jellies for the last few years so that I can smell summer on my toast on a cold November morning. I didn’t realise how much I would love jam and jelly making, especially when some of the ingredients comes from the hedgerows and the garden. There is nothing like having a cupboard full of your own various jars from different times of the year. One very easy preserve to make is an apple jelly. This sweetly tart jelly is beautiful as an accompaniment to pork dishes. My own favourite is a plain crab apple jelly which I love with grilled chorizo off the barbeque. But I also use the following Bramley apple recipe as a base for the elderflower jelly as well as other jellies such as mint, rosemary or even chilli. You will need a jelly bag or a DIY version of one, which is what I use because every year I find myself, yet again, without the real thing. I use a large colander lined with muslin as my substitute. There are a few rules to jelly making. If you are someone who can’t resist squeezing the juices out of the jelly bag, be prepared to get a cloudy jelly. I find if I let gravity work its magic overnight on the jelly bag, I always get a beautiful sparkling clear jelly. 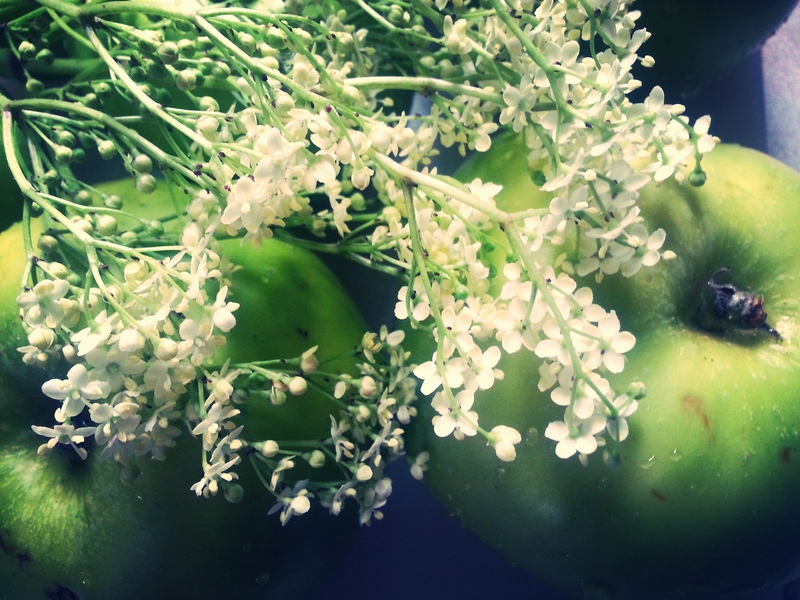 The only rules with picking elderflowers are to pick them on a warm dry day, never when it’s wet. Make sure the scent is good as trees differ. You will soon know a very well scented one and that will be your tree every year. Make sure to pick heads on which there are flowers just beginning to open with plenty of buds that are still closed. And of course, remember to leave some on the tree for elderberry picking! Wash the apples and cut into rough chunks. Do not remove skin or core. Make sure to remove any bruised pieces. Put the apples into a large saucepan with the water and the thinly pared zest of the lemons. Add the elderflowers and push under the water. Cook for about 30 minutes till the apples are reduced to a pulp. Add the pulp to a scalded jelly bag (or your DIY muslin version) and allow all the liquid to drip through into the collecting container usually overnight. Measure the volume of the resulting liquid into a saucepan. To sterilise your jars: place clean glass jars into a moderate oven at 180⁰C/350⁰F/gas 4 for 10 minutes. For every 600ml of juice allow 450g of sugar. Heat the sugar in a low oven. This helps to dissolve the sugar quickly but is not a necessary step. Squeeze the lemons and strain the juice into the juice. Bring the juice to the boil and add the warm sugar. Turn down the heat and stir gently until the sugar has dissolved. Increase the heat again and boil for about 10 minutes without stirring. The jelly should reach setting point in this time. Skim off any scum that may have formed on the jelly using a slotted spoon. Test that the setting point has been reached by pouring a teaspoon of the jelly onto a very cold plate – I place one in the freezer. The jelly should crinkle on the cold surface. The jelly should be potted immediately into sterilised jars. That's it. All over. Thank you.